It is our great honor and pleasure to welcome you to the 1st International Conference On Electrical and Information Technologies (ICEIT’15) organized by Mohammed V University of Rabat, which will be held in Marrakech, on March 25-27, 2015. 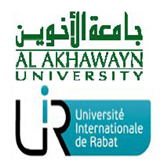 The ICEIT’15 is sponsored by IEEE Morocco section, co-sponsored by Al akhawayn University and the International University of Rabat. The International Conference on Electrical and Information Technologies (ICEIT’15) aims to foster knowledge and expertise exchange and technology transfer among Electrical Engineering and information technology communities from academia and industry. Therefore, the main goal of ICEIT’15 is to bring together scientists, researchers, engineers and practitioners interested in any one of a wide range of topics and aspects it covers which are focused on electrical and information technologies. Moreover, it also aims to provide real opportunities for expertise and knowledge sharing and dissemination among its participants. Marrakech, the conference venue, is the most important Morocco's four former imperial cities and it is among the top ten world tourist attractions according to a recent survey by CNN TVchannel. It is a wonderful place that will welcome participants to this important event. We are looking forward to seeing you in Marrakech, Morocco in March, 2015. We believe that you will enjoy the technical activities of ICEIT’15 as well as your stay in this elegant city.